Here’s a short, sweet little recipe for spring. Many beverage recipes call for “strawberry syrup,” a bright red, sugary syrup that gives a strawberry flavor and color to drinks. Why buy the bottled stuff when it’s so easy to make your own? Strawberries are in season right now, which means you’ll have all kinds of beautiful berries to choose from at the market. Plus, you’ll have the added benefit of knowing what went into your syrup– just three ingredients, all natural, nothing artificial. Sugar acts as a natural preservative, so all you need to do is refrigerate. The syrup will last for weeks (but it’s so addicting, it never lasts that long in my kitchen!). 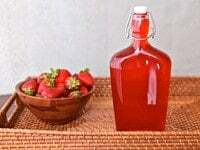 Homemade strawberry syrup can be used for a number of purposes. It is most commonly added to beverages and cocktails to give them a strong, sweet strawberry flavor. Try adding it to lemonade to make strawberry lemonade or seltzer to make a strawberry spritzer. It makes a lovely addition to cocktails and mocktails. You can also drizzle it on pancakes or waffles as an alternative to maple syrup. So many possibilities! Rinse the berries clean, then hull them with a paring knife by slicing around and pulling out the stem. 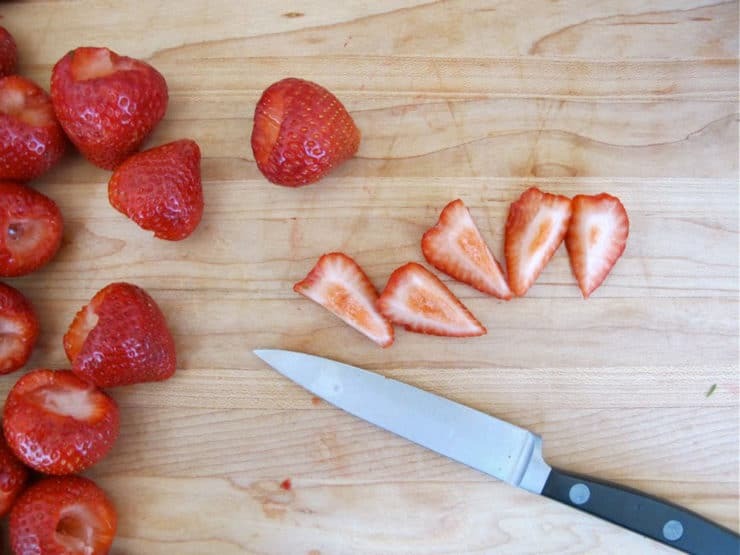 Slice the strawberries into smaller pieces. 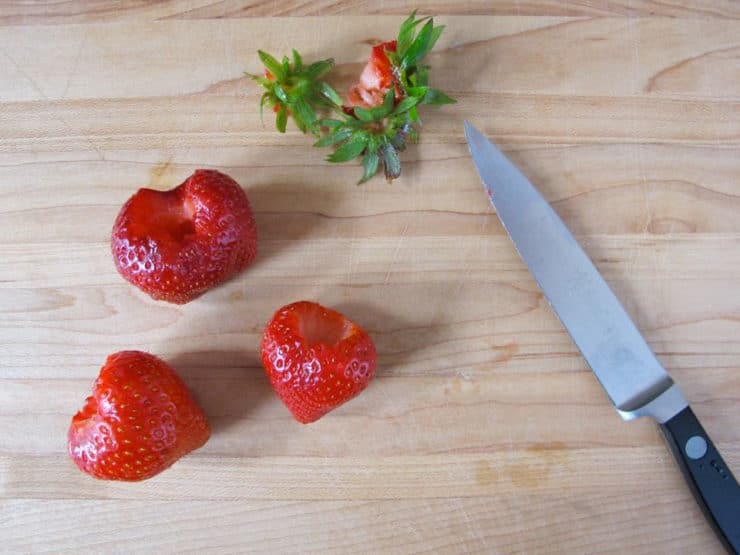 Place the strawberry slices in a medium saucepan. Cover with water and bring to a boil. 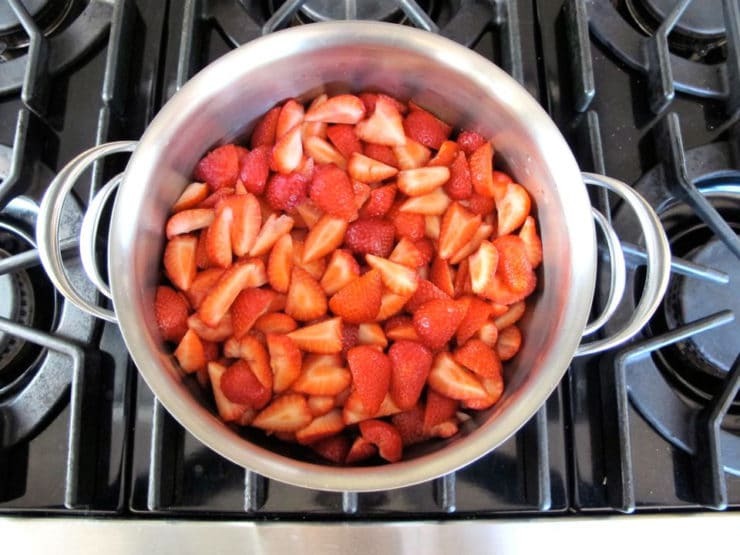 Reduce to a medium simmer and let the strawberries cook for about 20 minutes. Skim any foam that rises to the top. After about 20 minutes, the strawberries will have lost most of their color and the water should be deep pink/red in color. Remove from heat. 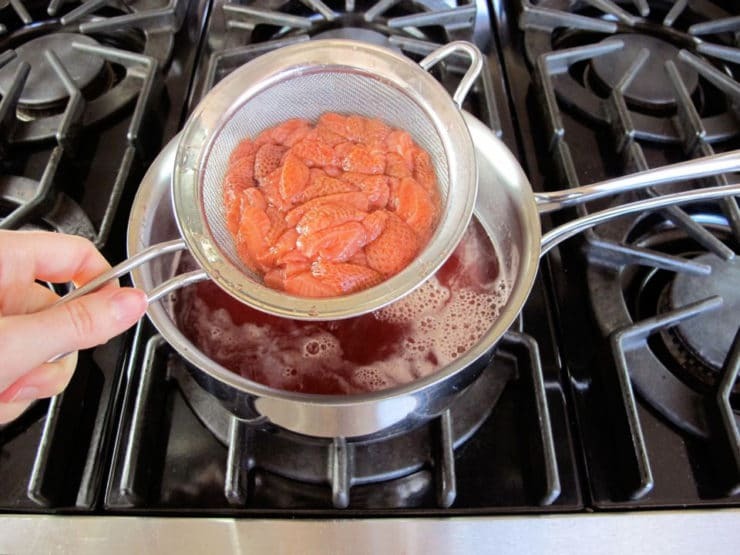 Strain the strawberry liquid through a fine mesh strainer into another clean pot, separating the solid berries from the liquid. 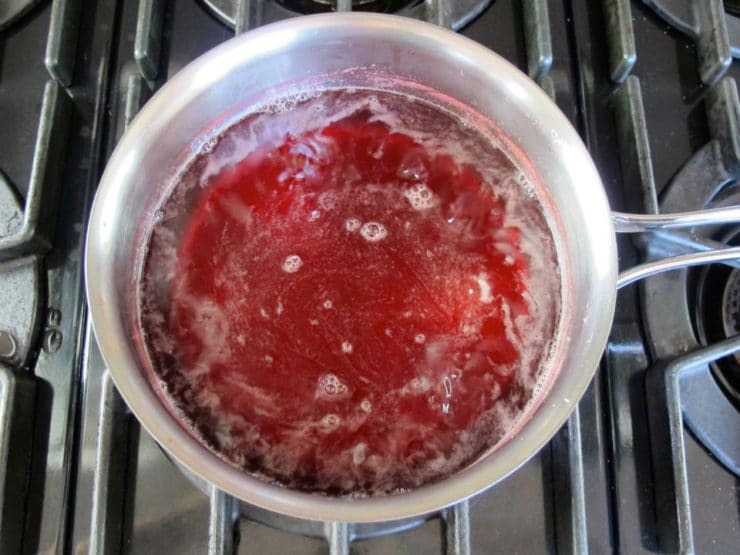 DO NOT press down on the solids to extract more juice; it's tempting, but doing this will make your strawberry syrup cloudy. Once the strawberry liquid has been strained, discard the solid berries. Add 2 cups of sugar to the strawberry liquid. 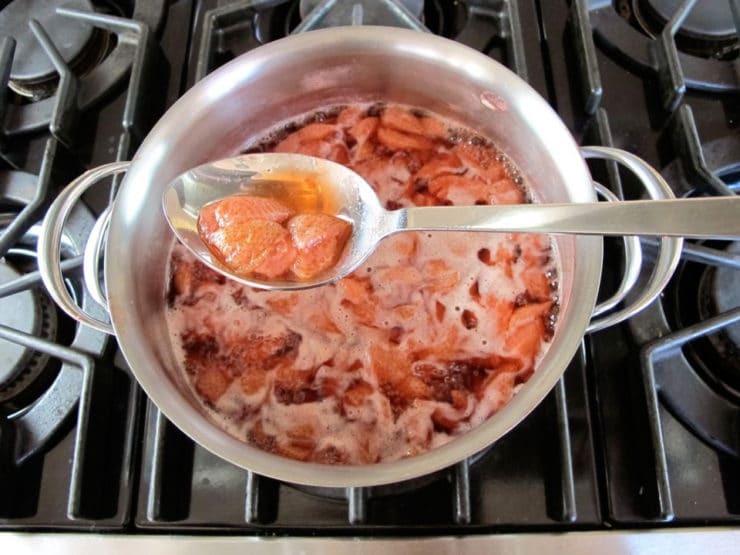 Bring back to a boil, stirring frequently to dissolve the sugar into the syrup. Let the syrup simmer for 5 minutes till the sugar is completely dissolved, skimming any additional foam that rises to the top. Remove from heat and allow to cool completely. Pour into a glass container, seal, and refrigerate. The syrup should last for several weeks. I was looking in all the Super market to buy the Strawberry Syrup, But i can’t find it and I check on line and find you, I don’t know much English but I’m trying to understand your receipt, thank Yoy very much. Dear Tory, Do you have an email address where I can reach you. Today I read about Momo. We lost our Louie dashund October 5 2017. He was twelve and the joy of our lives. I wanted to tell you about him when we took him for his last ride to The University of Pennsylvania ER. I wish we were yet young enough to love another little soul, but we are not. Let me say that you are an amazing woman. I received your sweet email. So sorry for your loss of Louie! It is so difficult. They love us purely and unconditionally. Louie looks like the sweetest soul, you can see it in his eyes. I take comfort in the thought that Louie and Momo are playing together somewhere in a place where there is only Light. Sending a big hug! Just made this for a glaze on a strawberry cheese cake. I let mine simmer for a while so that I could get a nice thick consistency and it turned out really well! Super simple and tasty. I’m looking to make a strawberry and fennel liquid, would I boil them down separately or together? Could you use this in milk to make strawberry milk? Hi Lara– yes, I think you probably could. I’ve never tried it, but this is a simple strawberry syrup recipe and should be good for stirring into a number of beverages. Jacob, it will not thicken into a syrup if you use Splenda, it will just remain watery. That was my concern. Thank you. Made it and love it. Tried some that I did not strain and poured it over vanilla ice cream. Happened to have a banana, so you know where this lead to. It was wonderful and addicting. To add more fresh strawberry flavor to this recipe here’s a great trick – especially if you’ve found cheap strawberries and want to use then all! I finely slice about half my strawberries before cooking, add about 4:1 ratio of sugar (4 berries to 1 sugar) in a bowl, add a tablespoon of lemon juice and a teaspoon of lemon zest. I just let it sit, stirring occasionally for about 30-60 minutes while the juice leaves the berries. I strain this “fresh” juice and add the berries to the pot with all the other berries and then follow the recipe as stated – adjusting for more or less berries. Then, once done with the cooked and strained berry syrup, I let that cool and add in the “fresh” juice. It makes for a fresher, more “real strawberry” flavor that the cooked syrup alone is missing. Used this strawberry syrup for an iced strawberry mint green tea for bridal shower party. It was a huge hit. I must note that the recipe calls for too much sugar. My recommendation is to pour in half the requested sugar, then taste to your preference and go from there. If you like chocolate cake use chocolate syrup instead of strawberr syrup it is the best, for chocolate frosting 1 cup of sugar 1can of 12 Fl oz evaporated milk 1stick of butter 2cups of chocolate chips heat milk and sugar and butter until hot stir in chocolate chips cook until chips melt stirring until mixed pour over hot cake . Can this syrup be frozen for use later? Thinking of strawberry tea love that stuff and other foods later in year and summer. Hi, Tori’s assistant Ashley here. You can freeze this syrup in freezer bags or a plastic container. If using a container, be sure to leave some space for expansion. Maybe could be canned Anna then put in water bath.. Longer life? This is a weird question but is there an alternate to sugar? I realize sugar changes its form but I want a healthy alternative such as honey etc. Lb bag I would like to use for the syrup. Hi, Tori’s assistant Ashley here! This recipe is best suited to fresh strawberries, as frozen strawberries tend to become softer, I would be afraid they wouldn’t hold up well. I used the frozen strawberries and it worked great! Sounds like this is a great recipe. I am a single senior and am wondering how long this lasts before spoiling? Hi Wendy, Tori’s assistant Ashley here! Since this recipe does not have preservatives, I wouldn’t keep it in the refrigerator for longer than 2 days to avoid spoiling. It says that it keeps for weeks, although it won’t last that long in the paragraphs before the recipe. I made this recipe delicious and it kept well for almost two weeks. I also took half of the syrup and boiled it down longer was the best pancake syrup I ever had! We are making this to make snow cones. Healthy and free of chemicals. I will let you know how it goes over with the little ones. ? This was exactly what I was dreaming of – a strawberry syrup that wasn’t a puree. It’s so pretty! I made it for my blog where I test out recipes and it worked out perfectly. Thanks for a great recipe! I live in rural Alaska and enjoy fresh produce when we get it, but produce, fruit in particular, tend to go bad before I can get to it all. This is a great way to make sure nothing goes to waste! Thanks!!! I am just curious , about how much juice is it for the 2 cups of sugar? I had made two whole flats into juice because I wanted to make jelly. I have some leftover but not sure how much i need for this recipe. Thanks for your time! I’m just guesstimating here Amber, but I think starting with 2 1/2 to 3 cups of juice would work. I never measured the leftover juice after the berries were removed, but my guess is that the water reduced by 1 to 1 1/2 cups by the time the sugar was added. At any rate, you can start with more liquid and simply simmer it down longer until the proper texture is achieved, it’s not an exact science. Good luck! Can I use this syrup for flavoring a cake? I am curious if you have any ideas of something that could be done with the extra strawberries as opposed to just throwing them out! Hi Frankie, I like to use them as a topping for ice cream or Greek yogurt. You can also blend them with ice cream to make a strawberry milkshake! Would this work for a cake flavoring? Love, love, love. This recipe saved my bacon. We needed extra Strawberry Syrup for our vintage cocktail caravan bar and all local shops had sold out AND we like we needed it yesterday!!!! Perfect recipe and perfect result. Thank you, totally converted ? First of all thanks for posting this. I am also curious if Stevia would work with this recipe? I am pretty sure it wouldn’t preserve the syrup like sugar would but I am wanting to mix this with seltzer water to make a natural strawberry soda so preserving it wouldn’t be all that important for me. If nobody has tried this recipe using stevia I will post my results here once I try it out. Mrs.Tori Avey, first of all I know I’m responding to an old post. However, I would like say thank you for this simple but brilliant recipe. I was trying to find something like this, because I am allergic to grenadine. Now, I can make all different foods with this special treat. One in particular, “Shirley Temple”, the allergy wouldn’t allow it. Anyway, thanks a bunch!! What is the yield range that this should give? 2 cups? 1 quart? etc… Thanks! Candace, as it says on the recipe card it makes 3 1/2 cups. I decided to try your recipe since I am going to use the syrup to make a natural soda. I was really impressed with the great red color. I didn’t want to discard the pulp so I just placed them in my blender and added another cup of sugar and got a nice creamy strawberry spread, although not as red as my syrup. Perfect syrup. Hi, can this syrup be used in frozen drink machines to replace the store bought syrup? Hi Traci, I’ve never used a frozen drink machine so I’m not sure what the syrup is like, or how sweet it is supposed to be. It might be worth a try, but I can’t promise what the results would be. If you do use Splenda it will sweeten the mixture like sugar, but the syrup will not thicken the same way. I made this syrup and really enjoyed it in lemonade. I am curious to try it without cooking the strawberries to try to get a fresher taste (as someone who made lemon syrup without cooking said it’s the difference between a marmalade/jam taste and a fresh lemon taste.) I have a juicer so I plan to juice some berries and then add the juice to cooled plain simple syrup. Hi! I tried this with my sister and we didn’t have any strawberries so my mum said use plums cause we have a huge plum tree. It worked. Very well. Delishius as my sister would say. Hi, I’m making this as we speak. Thank you so much for this! Do you have any idea what I can do with the leftover strawberries? I’d hate to waste them. I love the natural, but the sugar is not an option for me. Can I use Stevia as sweetener? Hi Lupita– yes, but the syrup will be a lot more liquid and will not thicken in the same way that it does with sugar. Is this syrup can be used for flavouring ? Tried with bananas as well with success. Thanks for instructions! I made this last month- it is delicious! I used seltzer water and the syrup to make strawberry soda for my kids and they loved it! It also makes a really delicious strawberry lemonade. I’m wondering if I could use this same process with peaches? I have a ton of farm fresh peaches in my kitchen right now, and I’d like to preserve them in a way other than jam. I love your easy and clear instructions. Very well done. Are there any rules for extracting? I would like to make different flavored syrups to add to seltzer water to make carbonated beverages without all the garbage. Since I will be diluting it, I would love the flavor to be strong. 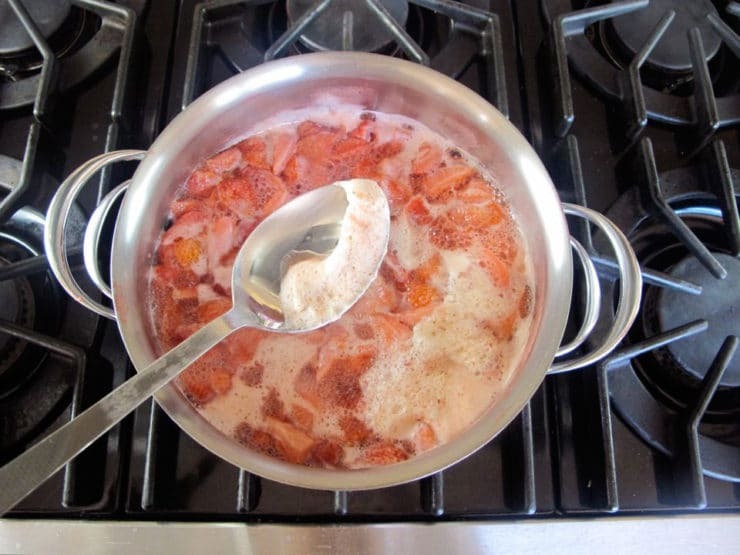 That said, I saw somewhere else where the fruit/herb was boiled WITH the sugar and water, then particles strained out. Is that essentially the same as your method of boiling the fruit/herb, straining, then boiling again with sugar? Also, is it just trial and error to determine the flavors strength? Or is there a ratio that needs to be followed? I love recipes that replace store bought items ladened with preservatives and unknown extras. This looks delicious. Would this work with other berries (i.e. blueberries, raspberries)? Raspberries will work great, I do it that way every year. Blueberries should too, but you may need more berries to get that deep rich blue color and flavor (I haven’t tried it myself so I can’t say for certain– you would have to experiment a bit). Enjoy! This looks good. Can anything be done with the remaining berry pulp, such as taking some of the finished syrup and creating a pancake topping or something like that? It’d be great if there were a way to avoid throwing out the berries — they might not look pretty, but they’ve probably still got some taste left in them. Thanks. Hi Jessica. Believe it or not, the berries are pretty tasteless after the extraction process. That said, I understand not wanting to waste them. What you could do is mix them up with some sugar then use them as a topping for pancakes or ice cream. They won’t be nearly as flavorful as normal berries, but they will still taste slightly strawberry-ish. Yes, you can! It may not solidify completely in the freezer, though. Will this work with Splenda instead of sugar? It won’t have the same preservative properties as sugar, but I don’t see why you couldn’t make it with Splenda to make it lower carb… I’m just not sure what the ratio would be of Splenda to strawberry water, since I’ve never tried it myself before. Perhaps try adding it to taste? It also won’t thicken in the same way that the sugar syrup will, which is no big deal for adding to beverages, but you won’t get a pancake syrup-like texture from it if that’s what you’re after. If you try it let me know how it worked out for you! I just did this with plums and it turned out amazing. I did actually can it in small jelly jars so it would keep longer and then I could give it as gifts throughout the summer. This is a lovely recipe, so simple – and it really does look very beautiful. I like that you can make it with several other berries. Do you think you could do something similar with Pomegranates? Interesting idea Leah! I make a pomegranate molasses which is much thicker than this: http://theshiksa.com/2011/09/07/pomegranate-molasses/ but a thinner beverage “simple syrup” would also be great. Putting it on my list for pomegranate season! Dear Shiksa, Anthony is a pro, certainly. Still, I´ve followed your recipes almost every day with surprise and delight, and I´m one of those NYC-DC foodie types who is always on the lookout for new restaurants and bistros. Hope you don´t mind that I´ve suggested some of your recipes to friends in the business, mostly on the French side. In the end, we must give Anthony his due, while I continue to delight in your ingenuity and astonishing creativity. BTW: I remain a fan of Jacques Papin and the late great Julia. My wife wants to learn to make it…. MMMMMMMMM I love my wife. I need a bigger fridge for all your cool ideas! I love the color of this syrup. I’ve been experimenting with simple syrups a lot this spring, and I think this one would make a killer mojito! Yes, this syrup is naturally preserved with sugar. It will last for several months in the refrigerator, or even longer if you know how to can it using a sterile canning process. Hmm, I’ve never tried it with frozen berries before… in theory it should work, but I can’t promise because I haven’t tried it myself. If I have a chance to try it I will report back! Happy to hear that Yolanda! Shiksa, you are culinary genius. Anthony Bordain had nothing on you. That is a pretty major compliment! Anthony rocks, I bow down to him. 😉 Thanks! Absolutely Nicole! I make raspberry syrup every year. Blueberries should also work, but you might want to start with less liquid for them to see how strongly they infuse. Enjoy! Thank you! Now I know what to do with all the strawberries I have here!